Nasi Rames. Photos: Sophia Brady. Asian Food Mart at Kippax Fair will be celebrating 20 years in business in 2019. The unassuming takeaway wedged between a liquor store and tobacconist in the busy Northside shopping mall has been owned and operated since 1999 by husband and wife team Andrew & Lila Gunawan. 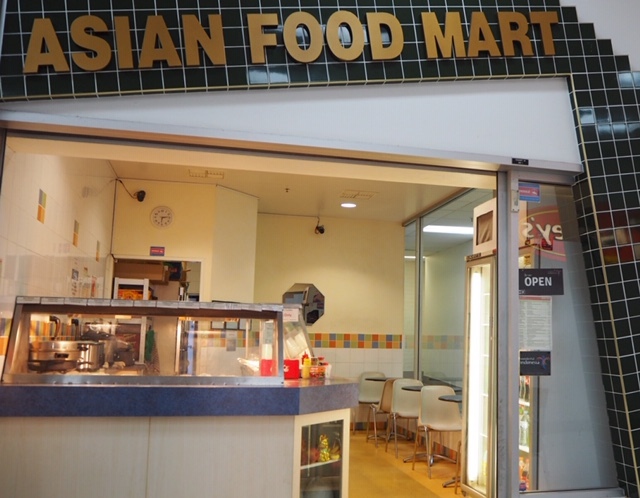 At first glance, Asian Food Mart fulfils hungry Northside locals cravings for Asian food favourites from their displays in the bain-marie. Selling a wide range of dishes from spring rolls to stir-fries, there was a steady flow of customers enjoying the variety on offer the evening we visited. On closer inspection, you notice a whole other menu taped to the side of the glass display. This menu is dedicated to ‘Makanan Indonesia’ – Indonesian cuisine, a much-underrepresented fare in the Canberra region. Originally from Indonesia, Andrew is a passionate cook and devised the menu based on classic Indonesian street food items and favourite dishes from his mother’s kitchen. The local Indonesian community travels from all corners of Canberra to get a taste of home. They are especially busy on the weekends when they offer two specials – ‘Mie Kang Kung’, noodles with chicken, prawn beansprouts and Kang Kung water spinach, and their most popular weekend special, ‘Soto Betawi’, a dish of rice with beef, tripe, tendon, potato and tomato in a spicy coconut broth. 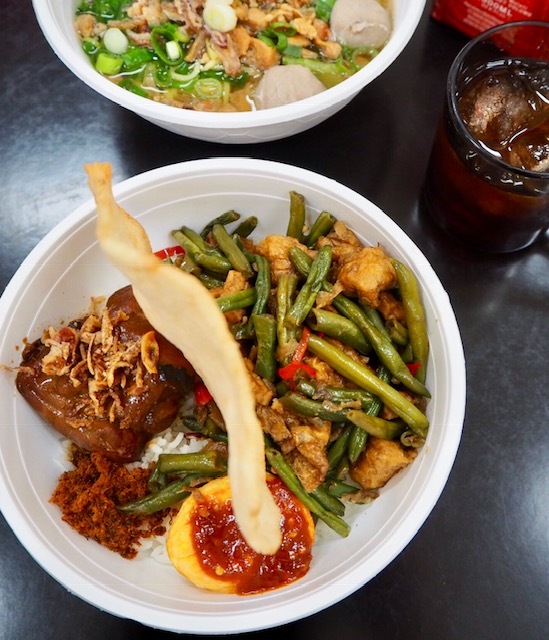 It is a quintessential Jakartan dish, and it can be found everywhere in that city, from humble food carts to convenient food courts in shopping malls, right up to ritzy five-star hotels. For our visit during the week for an early dinner, Lila was taking orders and guided us through the menu and suggested we order some much loved Indonesian classics. After surveying all the tempting selections including ‘Nasi Goreng’, we ordered the ‘Gado Gado Longtong’, ‘Nasi Rames’ and ‘Mie Baso Sapi’. Food arrived quickly and was all served with no fuss or pretence with plastic cutlery and bowls to our little table. 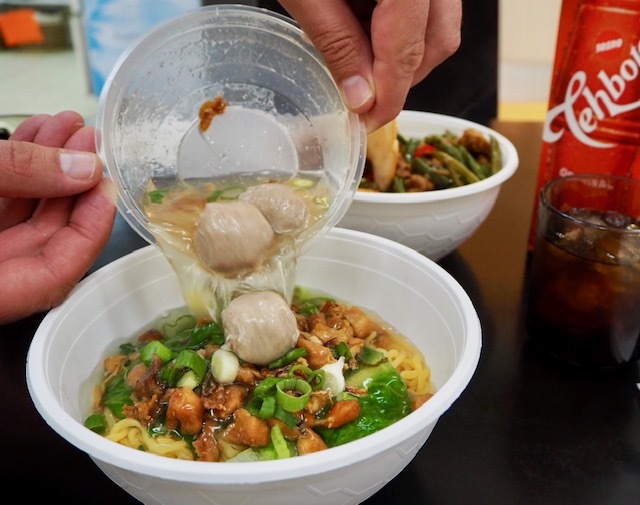 First, we tried the homely ‘Mie Baso Sapi’, the beef ball noodle soup, a dish I can imagine craving when feeling poorly and needing a light comforting broth. The beef balls were delicate, flavourful and I could have happily eaten 20 more of them. Next was the ‘Nasi Rames’, rice with Gulai chicken, egg belado, cooked with tempe and beancurd. A seemingly simple dish with each ingredient beautifully cooked. The favourite element was the egg belado, a hard boiled egg which is peeled then fried and coated in spices. Best dish of the evening was the vegetarian ‘Gado Gado Longtong’, rice cake with mixed vegetables, tempe, beancurd, potato and egg in peanut sauce. Upon ordering the dish, we were given an option of having a spicy peanut sauce which we quickly agreed to and it was outstanding, served warm, it bound and flavoured the other ingredients. The experience left us wanting more and curious to try the famed weekend Indonesian cuisine specials. With its friendly price points, ranging from $8 – $16, it is definitely a suburban gem to return to! Asian Food Mart is located at Kippax Fair, Hardwick Crescent, Holt and is open all seven days of the week. Thank you for this introduction, quite a gem.